The whole purpose of a cleanse is to get the sludge out of your body and bring your system back into balance. Therefore, it kind of goes without saying, that one will be running back and forth to the bathroom. However, with the detox we just did at the ashram, I had no idea it would be more like bee-lining to the can over and over and over again, all night long…We started by drinking about a litre of warm salt water with lime, then we did 4 yoga poses to help get things moving. We drank and did our poses until it was anywhere from 8 – 10 litres or more. Once the flood gates opened there was no turning back! But I have to say that the whole process was kind of fun because we were all doing it together, everyone cheered when someone had “success” and ran to their room, and for those who seemed to be pretty plugged up there was personal attention by our wonderful resident nurse and an enema tube! Before we eat every meal, we join in to chant a mantra that acknowledges a Higher Power that pervades all things, including our food. The offering (organic food lovingly grown and brought forth from the earth), the receiving (of the meal that has been mindfully prepared), the energy that we consume (and is transformed in our bodies). Like a Vedic saying of “grace”, we tune in to this Higher Power and feel gratitude and connection. So thinking of this changed my cravings and helped me get down that last mouthful of ghee instead of complaining, criticizing, or wanting something else. I know that when I get home I will likely give in to my cravings on occasion, but this journey (and detox) is giving me the tools to make better choices. Here’s a pic of post-detox. Still a little unsettled in the bowel department but feeling lighter, clearer, and more grateful. The weather here in Tapovan is changing as we approach the winter season. It’s cool and windy in the mornings, and with no heating (other than some space heaters) at the ashram, we are all bundled up in the morning with jackets, shawls, and hand-knitted slipper socks (I am now a convert to socks-with-sandals out of necessity…chilly feet in my flip flops!). Our meditation hall isn’t too bad but the yoga hall is freezing sometimes, with that Himalayan wind whipping through. It is actually refreshing, knowing that it is carrying special “prana”. There is change in the weather of another sort as well. As one of my teachers said this morning, our thoughts/emotions/feelings are very much like the weather – sometimes calm and serene and other times raging like a storm. I knew it would happen to me at some point…the feelings of homesickness, frustration with cold showers, boredom with the same food, craving for a latte, longing for my husband’s arms around me, then anger at myself for not staying focused. This is being human and all of us here are playing out similar patterns of wanting something else; of wanting to be somewhere else. I had my mini-meltdown in my room one evening, and cried and cried…but instead of beating myself up for being a “baby”, I just let it happen and really allowed myself to feel it in my body, feel it in my heart. Just like the weather, the little storm passed. Rather than letting it get to me, I let it go and moved forward to face another day with a little more space, a little more compassion for myself in my heart, and a feeling of empowerment that gave me the assurance that I can handle this. The sun is out today, there is warmth on my face and I’m ready to get back to class. Hari Om! 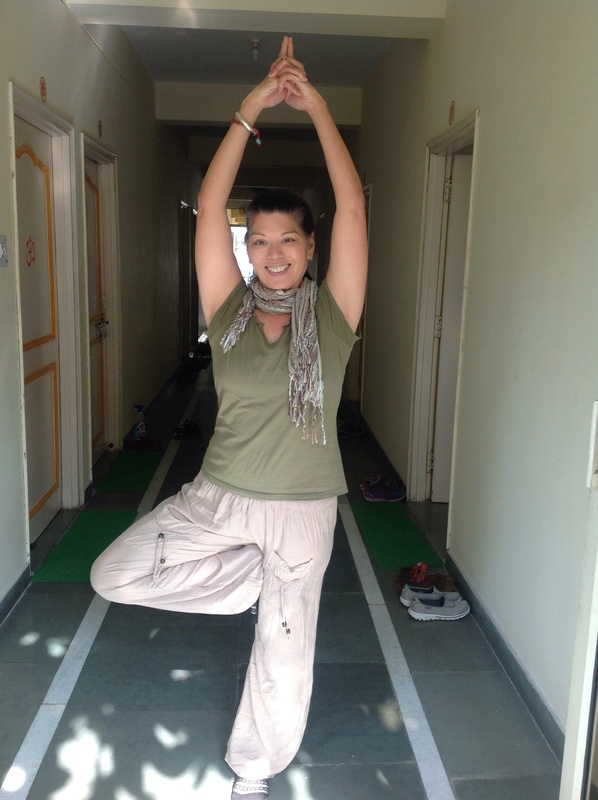 When I first arrived at the ashram, I felt like a tourist at a hotel. After settling in, getting my bearings, and figuring out the lay of the town, I now feel more like part of a big family that eats, sleeps, lives, and works together. Our schedule is busy – up at 4:30 am to make our 5:20 am meditation, then yoga class at 6 am. Classes, lectures, reading, homework, practice, and weekly karma yoga to help clean the ashram…the days fill quickly. With small pockets of free time, we all scramble to the internet cafe for a chai and a quick email check-in with our loved ones. Our commitments and responsibilities as students are many but all in the name of self-discovery, growth, transformation and service. This is made possible in part by many unsung “heroes” behind the scenes that keep things running so smoothly so we can keep our focus. Like the staff who arrive very early to ensure that we have hot water and fresh limes at 5 am. The kitchen crew who mindfully prepare our three daily meals with care and serve us in their own unique way (the older man with the white and orange hair who bangs on the pot to get our attention and overloads the second helping; the young guy with his colourful sweaters and skinny jeans; the tall fellow who offers two versions of tea – “sweet or no sweet”). The daily laundry man who returns our clothes washed and neatly folded for what amounts to less than 20 cents per item. The ashram manager who quietly roams the hallways ensuring all is well. Everyone has a job to do here, and they do so willingly and with pride, no matter how small. Yoga teaches a similar ethic called “TAPAS” and refers to the commitment and devotion to the work required on the spiritual path. To support growth and transformation, one needs to step up, be present, do their best, and balance their energy. Yoga has so many wonderful techniques and practices for this, many of which we have been experiencing daily. I sincerely hope these wonderful people in the background of our busy day have their own moments to sit back, breathe, and relax for they have so earned it. I’m very grateful they happily share their backyard with me.. This is my 5th day in India…and I could write a book about the experiences of every day. I have limited access to the internet, and the free time I do have is meant to be studying, not sitting in front of my iPad. But some things need to be shared, especially about how I have shifted from being totally out of my comfort zone to acceptance, respect, and appreciation for a culture that I (like many of us “rich” Westerners) have, in many ways, often misunderstood. My comfort zone was challenged from the moment I stepped off the plane in Delhi to a smog-laden, noisy, smelly city. For the next 24 hours I would see things that both shocked and awed me, as we drove through a city full of many riches, but also with poverty such as I have never seen in my life. Our bus driver was an expert at maneuvering us through crazy streets and traffic I could have never imagined (people are supposed to drive on the left but that doesn’t stop them from passing on the left, right, middle and shoulder of the road…) and through roads that by our standards would be considered off limits due to poor maintenance. But people here seem to manage…and get to where they need to be day after day. 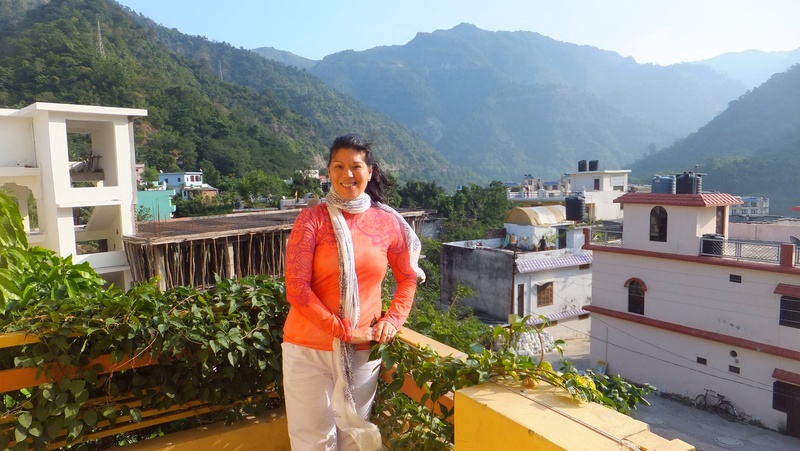 I could finally take a breath of fresh air as we reached the ashram in Tapovan, a village just beyond Rishikesh, with the Himalayan foothills right in our backyard and the Ganges minutes away. The ashram is located in a spot that receives the winds from the Himalayas, laden with that wonderful energy we call “prana”, and during our yoga practice in the hall upstairs, we take this in through our bodies, breath, mind, and hearts…it is a magical place. Getting used to ashram life requires letting go of the luxuries and getting back to basics. Nourishing sattvic vegetarian food, simple accomodations, quiet evenings (except for the barking of wild dogs and non-stop firecrackers on Diwali! ), and early sleeps are so conducive to getting one’s body and mind on track. It’s like doing an extended detox for body and soul…only with the support of the community of like-minded people who have come from places like Brazil, Italy, Japan, the US and Canada. We are all here for a teacher training program, but we are first and foremost here to re-connect with our own true selves, for when we come to live from that place of inner peace/beauty/bliss, we grow into authentic teachers of this profound practice of YOGA. My perspective has shifted since I arrived, and when I walk the village streets filled with everyone from tourists to locals, from business owners to beggars, from rich to poor (and from monkeys to cows! ), I am beginning to see more and more how we are ALL connected. I am happy to walk down those dilapidated narrow roads full of life and lessons to learn, because for the next several weeks, this will be my backyard.